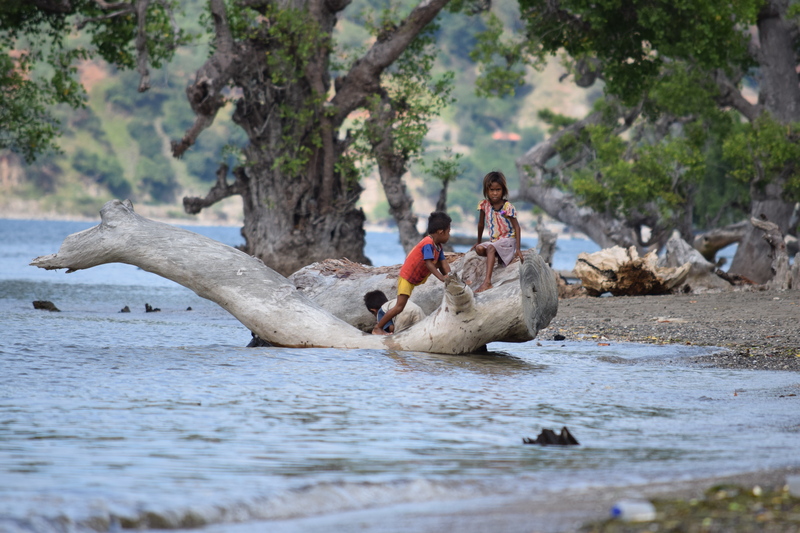 Children playing on mangrove stump in Tibar Bay, Timor Leste. Photo credit: USAID Adapt Asia-Pacific. The people of Asia and the Pacific are highly vulnerable to impacts from climate change and climate variability due in part to the high concentration of people living in vulnerable coastal areas and river basins. Many countries in the region are experiencing frequent and intense flooding, drought and storm events. Key economic sectors, especially in developing economies in the region, are already feeling the negative effects. Globally, the financing needs for climate change adaptation in developing countries to 2050 are estimated at $100 billion annually. Various climate change funds associated with the United Nations Framework Convention on Climate Change have been established, with the goal of mobilizing the required finance. Identifying and gaining access to these resources is essential to countries in the region if they are to successfully adapt to climate change. However, many developing countries face major capacity challenges in preparing high quality adaptation project proposals to access these funds. The USAID Adapt Asia-Pacific programme (2011-2017) integrated knowledge transfer, capacity building and technical assistance to link climate funding organizations with eligible Asia-Pacific countries and help prepare projects that increased resilience to the negative impacts of climate change. Find details of the programme's objectives, activities, outcomes and extensive resources below. Knowledge Sharing Platform. USAID Adapt Asia-Pacific works in close coordination with Asia-Pacific Adaptation Network (APAN) as the regional knowledge sharing platform to disseminate information on adaptation-related topics. Annual Forum. Held in a different country each year, the USAID Adapt Asia-Pacific Annual Forum brings adaptation funds and project proponents together and establish the forum as a key mechanism in Asia and the Pacific for facilitating access to funding opportunities. Capacity Building Program. Based on our project identification and screening process, USAID Adapt Asia-Pacific provides the training necessary to develop in-country skills to prepare sound adaptation projects for financing. Project Preparation and Finance. USAID Adapt Asia-Pacific identifies potential project proponents and mobilizes teams of highly-skilled project preparation and technical specialists on an as-needed basis to help create bankable projects. As cross-cutting themes, Adapt Asia-Pacific promoted regional networking, gender and other social equity issues. These areas of work are represented in the extensive knowledge products produced by the facility, which are provided below. USAID Adapt Asia-Pacific focus countries include Bangladesh, Cambodia, India, Indonesia, Laos, Maldives, Mongolia, Nepal, Philippines, Sri Lanka, Thailand, Timor-Leste, and Vietnam. Eligible nations in the Pacific include: Cook Islands, Federated States of Micronesia, Fiji, Kiribati, Marshall Islands, Nauru, Niue, Palau, Papua New Guinea, Samoa, Solomon Islands, Tonga, Tuvalu, and Vanuatu. An Online Sourcebook: Integrating Gender in Climate Change Adaptation Proposals - enables project proponents to design gender-responsive climate change adaptation measures as well as projects, particularly in developing countries, by providing targeted, sector-specific guidance and real-life examples that are easy to follow and navigate on laptops and mobile devices. Capacity Building Program on Economics of Climate Change Adaptation - aimed to produce a cadre of practitioners in government who can prepare high-quality economic analyses related to climate change adaptation projects and programmes, to strengthen governments’ capacity to more fully integrate climate change adaptation into national, sub-national and sector planning and budgeting. Urban Climate Change Adaptation and Resilience – A Training Manual (2015) - a standalone capacity building program that aims to improve climate change knowledge among mid- to senior-level managers working in urban and infrastructure planning and, in turn, help them design better adaptation projects. Gender and Climate Change Adaptation: A flexible training package (2017) - a standalone capacity building program targeted at government officials and practitioners, focusing on integrating gender into climate change adaptation practices. Guide to Climate Change Adaptation Project Preparation (2017) - distills lessons learned from these experiences and will help applicants identify and structure the information needed to build an adaptation project proposal. Understanding the Green Climate Fund: Implications for the Evolving Architecture of Direct Access to Climate Finance (2012) - describes and explains the establishment and design of the GCF and outlines key considerations which should be taken into account in the design and operation of National Climate Funds to enhance their readiness to directly access international climate finance. An Assessment of Specialized International Funds with Available Resources for Climate Change Adaptation Projects in Asia and the Pacific (2012) - provides an in-depth understanding of the existing pool of international climate change funds which can provide resources to finance adaptation activities in USAID Adapt Asia-Pacific‘s target countries. Supporting National Climate Funds and Climate Public Expenditure and Institutional Review in Asia-Pacific (2013) - outlines capacity development activities undertaken to support the management of National Climate Funds (NCFs) and Climate Public Expenditure and Institutional Review (CPEIRs). USAID Adapt Asia-Pacific: Project Preparation Approach Paper (2012) - summarises the variety of projects identified by each country and by major donors, examines the climate finance readiness of countries and the most promising points of entry for the USAID Adapt Asia-Pacific programme as well as possible capacity-building requirements. Since 2011, USAID Adapt Asia-Pacific has developed 36 adaptation projects, including 9 gender-inclusive projects, in 14 countries across the Asia and Pacific regions in association with national and international partners. The project has trained more than 1,000 people, delivering 25,000+ person hours of training. The project has helped to leverage over US$576 million in adaptation financing for projects that have benefited nearly one million people. In addition, the project has disseminated a number of widely-used knowledge products pertaining to climate change adaptation finance and project preparation, and has developed four courses focusing on various aspects of climate change adaptation project development.